PARIS -- Uber is suspending its low-cost ride-hailing service in France, hoping to defuse an escalating legal dispute and sometimes-violent tensions with traditional French taxi drivers. The unusual concession comes after the stakes mounted this week in Uber's standoff with France: Two senior European managers for San Francisco-based company were detained Monday and ordered to stand trial, charged with "deceptive commercial practices." It reflects the broader struggle of governments to keep up with fast-moving technology - and how to tax operations like Uber's and protect workers and consumers. Companies like Uber argue that governments are unfairly protecting entrenched industries instead of adapting to the times. Uber Technologies Inc. has run into legal problems elsewhere in Europe, as well as in China and India. The French battle centers around Uber's low-cost service, in France called UberPop, which links users to drivers without professional taxi or chauffeur licenses. French authorities had ordered it shut down, but Uber refused, pending a legal decision at a top French court. Uber France chief Thibaud Simphaud said in an interview published Friday in Le Monde that the company changed its mind "in a spirit of bringing peace" with authorities. An Uber spokesman confirmed to The Associated Press that the service is being suspended starting Friday night. Simphaud and another European manager for San Francisco-based Uber were detained this week and ordered to stand trial Sept. 30. They are accused of six counts including deceptive commercial practices, complicity in instigating an illegal taxi-driving activity, and the illegal stocking of personal information. 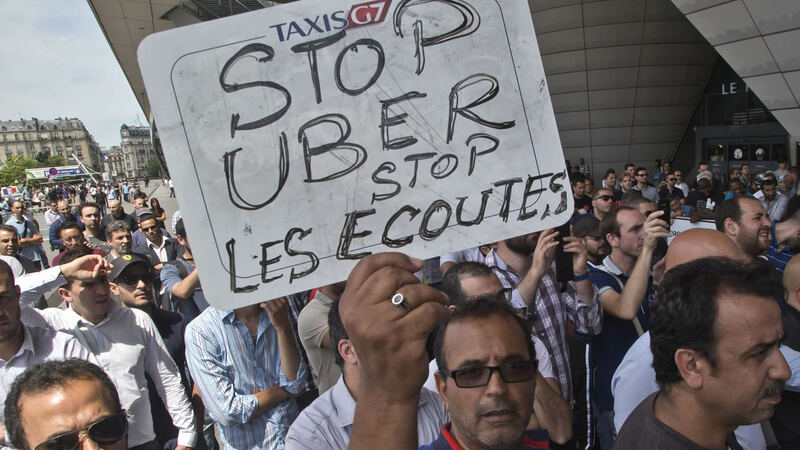 Claiming unfair competition, taxi drivers staged a violence-marred strike last week, blocking many roads across France. Uber's regular app-based service, which connects registered drivers with riders, continues to function in France. Uber claims to have a total of 400,000 customers a month in France.